Vikram is one of the most talented as well as hardworking actors not just in Tamil Cinema, but perhaps across Indian cinema these days. I don’t think I will be exaggerating when I say this. After all for someone who had started off as an actor way back in 1990 with En Kadhal Kanmani,before finally finding success with Sethu in 1999, he has come a long way indeed. It wasn’t that he got a bad start, in the first 3 years of his career itself he had 4 Tamil films as hero, which included films directed by well-known names like C.V.Sridhar, S.P.Muthuraman and P.C.Sreeram. His best bet among these definitely was P.C.Sreeram’s Meera (1992), a film whose music is popular even today but which somehow did not live up to its potential. Later Vikram went on to feature in many Malayalam and Telugu films, mostly as the 2nd lead, in an attempt to survive and keep himself running in the race. He received another opportunity to make it big in 1997 in the form of Ullaasam, a film which had everything suggesting a promising entertainer. Co-starring Ajith, who was reasonably popular by then, the first (and last) Tamil film produced by ABCL and with rocking music by Karthik Raja, everyone expected the film to work, but fate had other things in store and the film failed at the box office. Finally Bala’s debut film Sethu, which was lying in the cans for a year or so after completion, found its way to the theatres and went on to become a big success, slowly but surely. In the process Vikram finally arrived as a star and Bala went on to become a sought after filmmaker. Post Sethu Vikram had a golden run, with hits like Dhill, Kasi, Gemini, Dhool and Saamy making him popular and showed his versatility as well. On the way he also collaborated with Bala once again in Pithamagan, a film which even fetched him the National Award for Best Actor. And then Vikram worked with Shankar to give us Anniyan, the biggest success in Vikram’s career and a role with multiple shades which is still fresh in public memory. One would expect that after the stupendous success of Anniyan, Vikram would go on to scale new heights, but alas that wasn’t the case. At that point of time Vikram and Suriya were literally breathing down the necks of Vijay and Ajith in the race to superstardom, but the last 10 years since Anniyan have seen Vikram slide and slide strangely in a manner that probably only he could explain. No, it hasn’t been a case of offers drying up, he has had 12 releases post Anniyan so far, which includes the 2 versions of Mani Ratnam’s Raavan/Raavanan & the 2 versions of Bejoy Nambiar’s David. 12 releases in 10 years is quite commendable, which includes 2 films this year, Shankar’s humungous I and Vijay Milton’s 10 Endrathukulla, being his latest release which is now playing in theatres. He has always been a hard working actor and we all know that. So much so that he has dedicated a lot of time and made sure his body underwent a lot of changes while working on films like Deiva Thirumagal and I, especially the latter. In between these films he even tried to have fun by doing films like Kanthaswamy and Rajapattai, but his efforts didn’t quite get converted into commercial success and/or critical acclaim. Let’s briefly look at each one of these films, with a slightly more detailed observation on the latest,10 Endrathukulla to follow it with. Majaa (2005) came straight on the heels of Anniyan and was expected to do well commercially, being a remake of director Shafi’s own Malayalam hit, Thommanum Makkalam. It was a watery Diwali when it released and the film just did not evoke any significant response from the audience, with the majority feeling it wasn’t a great subject to have been remade to start with. After a brief gap Vikram’s next release was Bheema (2008), which saw director Lingusamy trying a gangster film for which Vikram underwent rigorous training to ensure he stayed fit and looked powerful to suit the character. But the film turned out to be a tedious affair and the audience wasn’t impressed. Susi Ganeshan’s Kanthaswamy (2009) was a much awaited film, what with the film being projected and promoted as a superhero film, something not usually seen in Tamil cinema. But that was exactly also the reason as to why the film didn’t do as well as expected, turning out as a poor version of a Shankar vigilante film rather than a superhero film actually. Susi Ganeshan and Vikram perhaps failed to appreciate the smart audience as wearing a mask alone doesn’t really make one a superhero. Mani Ratnam’s Raavan/Raavanan (2010) saw Vikram explore 2 different roles in the 2 language versions based on the same concept, while the Tamil version saw him play the anti-hero in style, as the cop who is not all that straight in the Hindi version he didn’t really look all that convincing. No wonder that while Raavanan was accepted to an extent, Raavan was quite a failure commercially and did not really get appreciated critically as well. 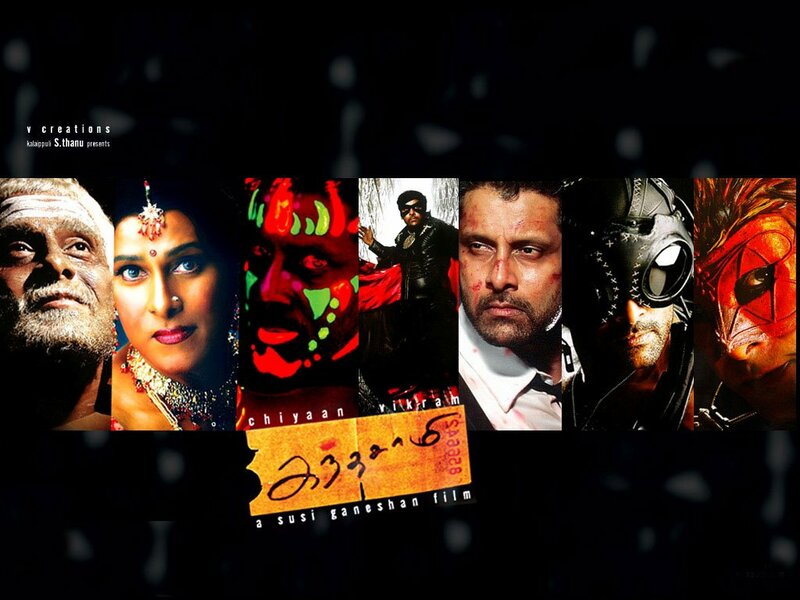 The very next year (2011) Vikram had 2 releases, A.L.Vijay’s Deiva Thirumagal and Suseenthiran’s Rajapattai. While Deiva Thirumagal earned some appreciation, even doing decently at the box office, Rajapattai was a disaster of epic proportions. If only Deiva Thirumagal was an original, Vikram and A.L.Vijay would have probably been appreciated all the more, but considering that the film was a freemake of I Am Sam, which had already seen a Hindi version as well, Main Aisa Hi Hoon, the novelty factor was a little lost despite Vikram’s hard work involved in pulling off the character of a mentally challenged person. As for Rajapattai what else to say apart from the point that it’s a film that does not look good in the filmography of Vikram and Suseenthiran. Vikram then joined hands with A.L.Vijay once again for Thaandavam (2012), a film which had potential but turned out to be a tad too dry for an action-thriller, making the audience disappointed as well. Bejoy Nambiar came up with the bi-lingual David (2013), a film which was a commercial disaster in both Hindi and Tamil, being rejected outright by the audience everywhere, despite Vikram putting in an earnest appearance. And then came Shankar’s I earlier this year, which once again saw Vikram giving it his best, physically pushing himself to an extremely different zone. While the film get noticed, even attracting many people to the theatres, thanks to all the promotions and Shankar’s popularity, beyond a point it looked Anniyan version 2.0, there being nothing new in the theme as such. 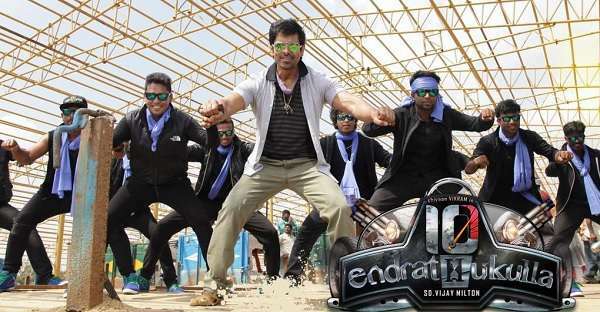 And then we have the new release, Vijay Milton’s 10 Endrathukulla which one hoped would at least be a fun entertainer. Starting off as a desi Transporter of starts, it becomes a road film with Transporter (Vikram) and a sweet but a little dumb sort of girl (Samantha) on the move, much later we see a Ku Klux Klan kind of a cult on the lookout for a lookalike of their incumbent leader and then the rest can be predicted, right? 10 Endrathukulla despite coming across a plate of bhelpuri with various ingredients doesn’t get it too wrong to begin with. There is something likeable about Vikram playing the lead character, despite being an action entertainer Samantha gets a lot of footage in the film, even contributing to the twist factor as well. It even has a couple of popular tracks, D.Imman having done some standard work over here. The supporting cast is quite heavy, with people like Pasupathy, Abhimanyu Singh, Rahul Dev etc. being part of the same and Charmme Kaur featuring in a song (it’s another matter that neither the song, nor its placement actually works). But somehow the film just ambles along, you don’t really feel anything for any of the characters, the VFX work is quite shoddy, slowly after a while you don’t even care why the baddies want the girl to be delivered to them. Yes the twist isn’t something on expected lines, but then it comes a little too late for people to suddenly invest their interest level back into the film. In a way 10 Endrathukulla probably is an apt example of what’s been going on in Vikram’s career post Anniyan. He’s worked with experienced directors like Lingusamy, Mani Ratnam, A.L.Vijay, Suseenthiran, but the films have turned out to be far from satisfactory. Is it a case of Vikram placing blind trust in his directors and not relying so much importance on the script, or is it something else that’s not coming across clearly?What else can explain someone so talented and hardworking like Vikram just not doing justice to his calibre in film after film? The question is all the more important because there aren’t really films which probably should have worked but did not for some reason in his case (post Anniyan). Perhaps it might just help him if pauses a bit, takes stock of his situation, chooses films with an interesting premise and more importantly a screenplay which holds solid promise right till the end. Till then nothing much perhaps is likely to change. We all know one Friday can change everything, the fortunes of an actor/producer/director can certainly change for the better or worse with just one film, but that isn’t something in their hands right? 10 Endrathukulla probably did not disturb me as much as it did for a lot of others and I just couldn’t understand at first why. It took me some time to understand later that somewhere down the line I never perhaps expected anything great out of it. Now that’s a zone which is dangerous for any actor, here’s hoping that we see Vikram getting out of this strange zone soon, giving us once again the chance to see the actor doing the kind of films for which we have always admired and respected him. Vikram is a great acting talent, but somehow I always felt that he is a poor observer of other Cinema and cinematic trends. In order to choose the right script, Actors should also spend some time researching audience tastes and other successful movies and scripts. Very few actors in Tamil, I feel do that, except people like Kamal Hassan or Siddharth etc. spare some time looking at studying audience preferences & improve his judgment of scripts.